Be seen to enjoy your Kiwi Celtic heritage. Wear tartan. All three are copyright designs to The Suit Surgeons Ltd, Dunedin, NZ. There are Irish County tartans, and some for Irish families and corporations too. 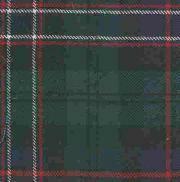 There are Tartans for Scottish Clans, Districts, Towns, and Regiments. and there are Canadian province, personal, family, regimental and corporate tartans, as well as for the USA. Have you seen the ancient tartans of the Tocharian Celts? Takla/Urumchi mummies from the Tocharian civilisation wore checked/tartan style clothes to their graves thousands of years ago. (more information on these mummies: New Scientist review a site on mummies, Tarim (China) mummies. In weaving terms tartan is a fabric with both warp and weft made from spun sheeps wool woven in an two over two under offset by one pattern. This gives a diagonal effect within straight bands of colour partciularly evident when bands of different colours intersect. Tartan is traditionally multi-coloured and patterns can be symetrical, asymetrical, repeating or non-repeating. Tartan is an historical and dynamic fabric providing warmth, identity, fashion and practicality, for all forms of attire. It is more popular today than ever before. Many modern tartans are simply created for their design appeal. Colours chosen are often meant to represent features or landscape colours. Synthetic aniline dyes are generally used today and these are often used to reproduce the colours derived originally from natural dye materials such as mosses and lichens and other plant or animal material. 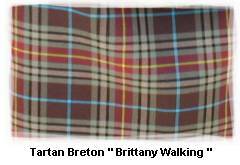 Tartan designs may also retain association with other existing clan or family tartans with minor variations. Many of the so called "clan" tartans are really just adaptions of the government sett which was itself based on a Campbell tartan used by Campbell militia which was that of a branch of Clan Campbell. Today the government sett is the basic Black Watch tartan. The truth is romanticism of the Scottish highlands and the tartans that were banned from use during the 30 odd year proscription period following 1745, introduced a rigidity in the "ownership" of many patterns. 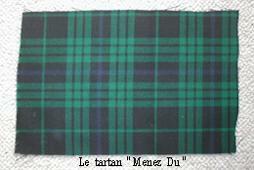 Many current tartans were re-invented after the specific thread counts and colours were lost. However there may be much more to the layout of tartan that simply meets the eye. Western society has a modern obscession with fashion design. Though not total, this has resulted in the fundamental rejection of many traditional clothing and fabric designs. Thank goodness the Scottish and celtic tartan phenomenon has survived and is growing again. Anyway, the general daily use of non-traditional dress may have obscured a more deep seated symbolism in the basic functionality of the tartan patterns. We can read elsewhere where the different colours used in tartan often indicated rank, occupation, within the society of the day. This is quite a common feature in all societies at some time during their development and still applies in many societies that do not follow the western world's pre-occupation with fashion. Researchers are beginning to note that very ancient symbolism and relational perspectives, have been measured and incoporated into the layout of ancient buildings, monuments, stone circles and a huge number of other hitherto unfathomed landmarks and landforms. Folk like the Maori incorporate symbolism into the tikitiki panels in their Marae meeting halls. Much of the meaning of this is lost on all but an initiated few. This means most people are basically ignorant of the significance and merely look at the the panels and consider the appearance and design. Sometimes they use these just as fashionable designs. This has happened to all sorts of designwork the world over. If we think that perhaps there is an underlying significance in the colours, the number of threads of each colour and their proportions in the overall weave of the tartan setts, how can this have any relevance to ancient symbolism and knowledge? Obviously modern tartans conceived simply for appeal, colour and creativity of an artistic kind are devoid of ancient historical meaning and symbolism. This can be said of many post-Culloden tartans. Probably also of the many tartan setts that were hawked around by the Scottish weavers even prior to the 1745 and other Jacobite rebellions. They used fabric swatch books to market tartan designs just like many fabric mills do today. Notwithstanding this, somewhere there will be a design relevance that has been, even possibly unwittingly, preserved within the weave of the fabulously rich and vibrant fabric we call tartan. The British Imperial system of weights and measures, was not British at all. It was a hand-me-down system of spectacularly significant magnitude. Unfortunately too many people forgot it's significance. The majority were uninitiated into it's profound principles and relational proportions, ratios and synergy with our planet, and it's place in our universe. We considered it archaic, too complicated and unfashionable so we threw it out. The world was seduced by the simplicity of the metric system and it's convenience when used with the form of computers we developed for commerce and the ease with which it could be taught to lazy or unconcerned minds. Today great minds are still trying to fathom the pyramids, the reasons for stone circles and so many other fascinating man made features in this world. Why? Because for whatever reason, the original knowledge was lost. So where does tartan fit in this? If we delve far enough, can we determine the significance of colour and proportion hidden in ancient design that was perhaps intended to preserve ancient knowledge by weaving it into our everyday lives. Just how blind and ignorant have we all become? Or are we just blithely unaware because we basically have lost the sense of peoples on a journey through time and live just for today following the whims of fashion and indulgence. Sometimes people hate sharing knowledge and prefer to keep secrets because their selfishness feeds their sense of power, or they may perceive some knowledge may be misused by other persons seeking power. In the end ignorance gains the upperhand and quite fundamental information disappears. Some revelations about historical relics make the countryside around us more fascinating. Perhaps some humble tartan patterns have the mystery of some intriguing lost knowledge woven into them. A key to origins past and history forgotten. Is that why some folk without any "Scots" in them, are drawn to the tartan and the romance of it? If we look through the history of peoples, even as far back as the graves in Tocharia, we can see tartan was there too. But tartan is here today and doing just fine, so let's enjoy it, wear it, and even revel in it. A tartan for me? 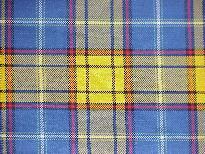 Lookup your Clan, Sept, District (Scottish/Irish), City, Province or name - try the Scottish Tartans Society. One cautionary note. 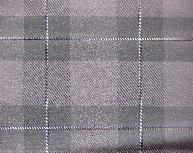 Don't expect your tartan to be commercially available unless it is one of the 300 or so more popular ones. 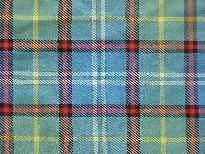 Most larger mills or manufacturers only commercially weave 250-350 or so tartans out of the 2500+ that are registered. Boutique weavers will weave any registered tartan (copyright protection or licencing permitting) at a price. If you didn't find a tartan for your name don't dispair. Just go back a couple of generations or so. There is bound to have been a tartan wearing ancestor somewhere in your family. If not, you can have your own tartan designed and woven - providing you can justify at least 30 metres or so for a commercial woollen mill to weave it. Or you can get just a full kilt length woven by a boutique weaving mill. Now that IS something personal and unique.